The focus in the flower garden and pumpkin Halloween. 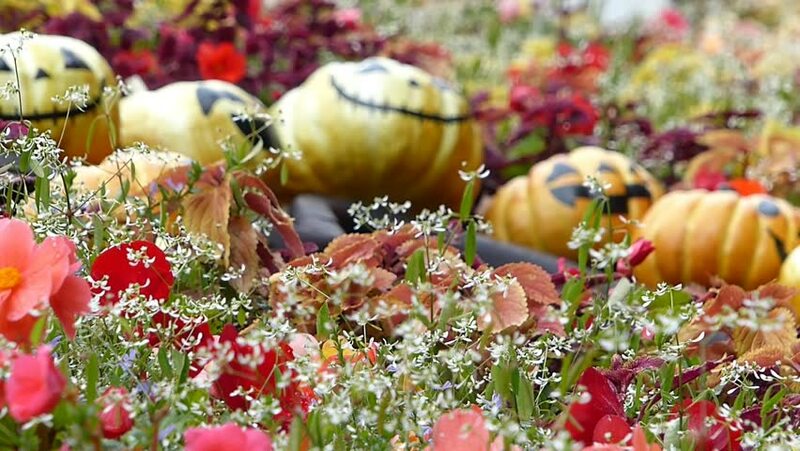 _1 / Taken at theme parks in Hokkaido, Japan in October 4, 2014 / The focus in the flower garden of the theme park Halloween pumpkin was added. hd00:11Christmas tree in a shopping center. hd00:13Christmas tree in a shopping center. hd00:10Beautiful mushrooms growing among the autumn leaves. Red caps of toadstools. A lot of autumn leaves are laying on the green grass. The camera focuses on fungi through birch yellow leaves. 4k00:38TIMISOARA, ROMANIA - APRIL 27, 2018: Beautiful floral decorations in the old Liberty Square, on the occasion of the "Flower Festival" organized by the City Hall.